Consumers love getting something for nothing, and this is the incentive behind loyalty points. But businesses never give anything away for free, and loyalty schemes can lead to customers spending more than intended. Taken at face value, loyalty points are an excellent way to get something for nothing. Shoppers spend as usual and collect an amount of points depending on how much they spend. These points can then be redeemed against future shopping, cash, and even airmiles. Sounds painless enough, but the actual amount spent on shopping to receive even a small dividend can be surprising. The reasons behind stores actually providing loyalty schemes can either be seen as good business sense or a manipulative ploy. Loyalty schemes don’t have the word loyalty in them because it sounds nice. Stores expect their customers to be loyal, and collecting points is one way to manipulate customers into shopping with them. Not only do stores expect customers to stay loyal in order to get points, they also expect them to spend more. Loyalty scheme providers expect customers to spend more than usual in order to collect more points. It’s also the reason that certain goods come with double and triple points. When it comes down to it, customers do need to spend a lot of money to receive their rewards. Spending £1000 in a supermarket such as Tesco will only provide enough points to gain £10 off the next shopping trip. Buying extra products simply to collect the points is a winner for the stores, not the customers. There is also the case that these goods may be purchased at a lower price elsewhere, but that just wouldn’t be loyal. The loyalty schemes are designed to stop customers shopping around for the best prices in order to collect more points. Stores are extremely competitive, and some will offer better rates when it comes to points versus the amount spent. A £10,000 spend over the course of a year in Marks and Spencer will reward customers with £50. The same amount spent in Tesco will see customers receiving £200 to spend on shopping. It does pay to shop around and research the loyalty rates if customers are going to use loyalty schemes regularly. Many credit cards come with inbuilt loyalty schemes but they can also come with restrictive terms and conditions. Customers can think they are going to receive an amount in cashback but if the monthly balance isn’t cleared the cashback won’t apply. Not clearing a credit card balance can also work against the value of loyalty points. Customers may think they have collected a number of valuable points only to find that the interest applied negates the value of the points. Always read the terms and conditions of any loyalty scheme, whether it is a credit or a store card. There are loyalty card customers and there are consumers who won’t buy into the loyalty schemes. Some think the schemes are simply a manipulative ploy by the stores to persuade customers to spend more. 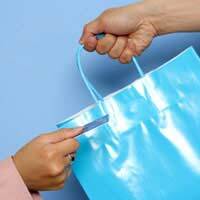 Customers who do shop regularly at one store can actually receive something back from their spending. As long as the customer doesn’t fall into the trap of overspending they can make the loyalty cards work for them.